Posted by santos. This entry was posted on 20050411 at 2:56 AM You can skip to the end and leave a response. hi mrs.t! did you read the article i linked to? i was thinking about how chef tried to make SPAM more interesting to the reporter, but i wonder if it was pushing it too far. after all, you really can't hide the flavour of SPAM, right? might as well stick to the basics. I love this blog to pieces, btw. Gorgeous photography, smart and witty writing, PLUS the loving acceptance of Spam. YUM! thanks for coming by! you are too cool for school. is it difficult to find spam in dc? OOooooo... I like the presentation. It's so elegant yet still my favorite combination. Spam and rice! I'll have to make this soon. I love spam musubi. Yours are much prettier than the brick-shaped blocks we get around Hawai'i. I blame you for my Spam recidivism. Today I made a 90 degree turn right in front of a UPS truck into a Hawaiian BBQ place. Saimin noodles with Spam stix, Spam musubi, I'm off the wagon again. It really isn't hard to find Spam in D.C. It's the looks of incomprehension amongst the checkout folks when I'm paying for five cans of that pink meaty tastiness. They usually have that look of "What? FIVE CANS???? Did the government say that there's going to be a terrorist attack, which is why you are stocking up? Because really, only a nuclear war and near starvation would make us eat meat in a can." So I do my shopping guerilla style. I get my mom to buy it for me. When I die, I will be cremated with a slab of the pink stuff. My ashes will be placed in a Spam can. candy--looking forward to those photos! third shift--(soothing tones) that's right, you've just gone through three of the 12 steps of spamaddiction: denial, blame, and acceptance....continue on your road to recovery and i'll send you a can of hot and spicy guam style spam! reid--SPAM KATSU!!!! you are blowing my mind. omg, when you are dead you'll smell like charred bacon. mmmmm. bacon. wow. what a way to go. 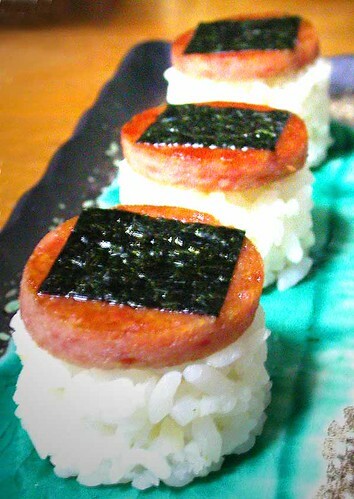 Your spam musubi is so attractive! hi marezone! itzbinsolong :-) cute, yes? You should definitely try it sometime. Marinate spam in shoyu/sugar for about 10 minutes, then dip in flour, then dip in egg, then dip in panko. Fry until golden. Place on a brick (thanks Alan =P) of rice, and wrap with nori! Mmmmmmm! If you don't like the Spam seasoned, you can skip the shoyu/sugar part. For even more flavor, you can mix your rice with furikake before shaping into bricks. Maybe I should do a post on it. Yes, I am also a closet Spam lover (well not so closet). What can I say? I've eaten in 3 star Michelin restaurants, enjoyed every bite, but sometimes you just want a bit of the 'ol pink stuff. It's fab in kimchi jigae (stew) by the way. Another of my favorite ways to eat it is to fry slices in a pan (no oil needed! ), put them on some nice soft white bread (must be the pappy variety, no chewiness here please), douse liberally with Kewpie mayonnaise, top with crisp iceberg lettuce and thinly sliced onions (Vidalia if you got 'em). Then tuck in for a very happy belly! Your blog always makes me hungry, think I'll go make me some aforementioned kimchi jigae right now! I love luncheon meat! The French think it resembles some stale meat for cat food but when they taste it in the fried rice I cook, they just ask for more! It's a favourite of children in Singapore too! All these luscious Spam creations sound great! Anyone out there know how to order the Guam Hot and Spicy here in the States? dave, i haven't seen the local edition in awhile, just the regular hot and spicy. maybe it's out of production...?